Your birthday is coming up and you can wish for one bottle of perfume, no matter the cost, which one will it be? Who should give it to you? Is there a chance you will get it? My birthday was on Saturday and I spent it on a plane back home to Vienna and then a train to the country and I enjoyed the solitude immensely, but I was also so very happy to hug my boys again after three days away. But it is nice to dream, and birthdays lend themselves for that very well. What is your birthday-perfume dream? This entry was posted in Armani Privé, Monday Question and tagged Armani Privé, Birthday, Fragrance, Monday Question, Perfume, shopping. Bookmark the permalink. 81 Responses to Monday Question – What Is Your Fragrant Birthday Wish? The Amber talk went well by the sound of it. Congratulations. Could I have a Gift Voucher for on of the sample/decant stores online instead please? From anyone who would buy me a gift anyway. Greedy, I know. It’s like asking the leprechaun for 3 more wishes. My wish is a day with Mandy Aftel and I get to invite 5-10 fumie friends and perfumers (I could already list these off..). It is my birthday in a few weeks and I put the word out that I want to buy samples/splits and decants, however, right now I really want to try different raw materials – oud’s, sandalwood’s and pure ambergris, maybe make an amber from scratch. Over on Youtube Marc(k?) 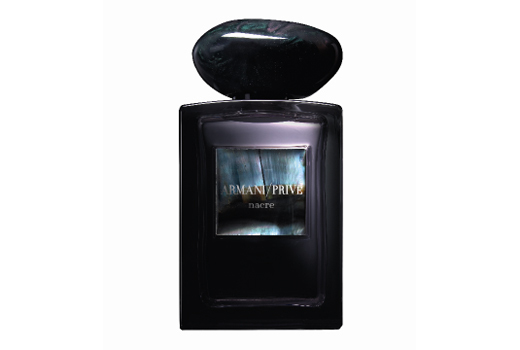 ‘robes08’ is hosting Fragrance Idol 2012 and the prize is exactly your question, Marc will try to source what ever fragrance you want, although he does note as long as it is within reason ie. not $4,000! I think there is a chance I will get one or both, because I always ask for gift-cards, then i get to choose what to spend them on! Polar opposites indeed! I love that your taste is so wide ranging. I hope you get lots and lots of gift cards. Happy Birthday, your boys and their matching outfits are precious! In regards to your question: Probably Back to Black, Liasons Dangereuse, or Rose Oud–extravagantly cushioned boxes n’ all. The day when I can buy my own actual bottle and not the travel refills is the day when a) I’ve amassed a huge fortune, or b) my mind has addled from longing and I spontaneously splurge at Saks. I hope the former scenario is more likely. Happy Birthday to you for Friday! Bless your boys, I bet they were overjoyed to see you. This is a very good question, my birthday is coming up in June so I have already started putting my list together (I’m always organised when it comes to my birthday). Nigel has been told that I would really love a bottle of Eau Noire or Honour Woman. They’re both quite pricey so we shall see! I re-smelled Eau Noire because of your love for it, but it still has too much curry for me, although I liked it a lot better than last time, I might come around to it eventually. Your boys are soooo gorgeous, nothing beats being back with your children. My first thought was exactly the same as yours, I would love La Femme Nacre if money was no object, I can not tell you how happy I am that you have confirmed my suspisions that it smells very similar to La Femme Bleue which means that I don’t NEED it right? It definitely means you don’t need it. The bottle is gorgeous, but that is not enough. For 500GBP I need to be blown away. Such a sweet picture of the boys, though I do think they missed a trick coordinating the numbers on their hats with your just turned age! Another vote for Honour Woman – or….and this may sound strange because I think it is only £60 and you said money was no object…that beautiful Irish scent we tested on Thursday: Castana (accent not supplied). It is my birthday next week in fact, but I am not hopeful of receiving perfume from anywhere. And with an impending move, I should probably be asking for a useful thing anyway, like a bucket or a breadbin. So did you totally fall for the new Irish scent? It is lovely. I hope you get plenty of gifts for your birthday, especially what you wish for the most (fragrant and otherwise). I certainly did. I think a lawn mower may be top of my wish list, which only costs a little more! Hahaha! Though Gap Grass was a big disappointment. Testing Madison Sq Park today and it is a bit grassy / watery / rose & peony-ish. Your boys are soooo cute!! !And congratulations on your Amber Evening,it sounds like it was a resounding success!My first idea for your question was La Femme Nacre as well(thanks to your review of La femme Bleue I nearly ordered a 5ml decant of it,but in the end the thought of spending 75 dollars for that seemed too crazy)-so tell us more about the similarities of the two,which one is better? ?So my more realistic wish is for Puredistance Antonia,or hold on,that doesn’t work out much cheaper! I can’t objectively compare them, since I don’t have a sample of Nacré and one sniff is not enough to judge, but enough to tell me I don’t need it. I would say Antonia does come out a lot cheaper in the end, since it is a very powerful extrait and that 17,5ml vial goes a very long way. To my surprise (and delight!) there is nothing that I am longing for right now. Doesn’t really seem possible, but I think that I have everything that I want. Actually, to be more accurate, I haven’t sniffed anything worth the $$$ in a long time, especially when I think of owning a full bottle of it. That is a wonderful state to find oneself in. I have experienced it too, alas, only for quite short periods of time until something new came along, and something always does… sigh. What a great question! It’s always fun to fantastise about guilt free extravagant perfume gifts. Like Laurinha above I might go for L’Heure Défendue (though I’ve only tried it once) or an Amouage attar. Like your Armani, you have to go for the top of the shop if someone else is paying, right? I don’t care who! I would love to receive the new MDCI release Chypre Palatin as a birthday gift. Also, Birgit, did you get to try Roja Dove’s new release Amber Aoud in Harrods ?. I did and I was not overly impressed or taken in, I must say. That is a bit of an unfair statement though, since one sniff tells you mostly nothing. I was not compelled to seek out a sample (which I would not have gotten there anyway). Guerlain Vega. Without a doubt. Chance of getting it from the hubby? Yes, there’s a chance….perhaps. I turn 40 in 2 years and I’ve already been very clear about my wish. I just don’t know if I can wait that Hope you had a very happy birthday, Birgit. Your boys are darling! Belated happy birthday! In that miraculous case, I would wish for a bottle of Jarling from my husband. OK, if we’re really going for outrageous wish fulfillment, I’d like to have the Tokyo Sky Tree perfume. It’s super rare, expensive fancy bottle, and it combines two of my interest (tall buildings + perfume), and waaaay aspirational. I bet the juice won’t even be that good (sigh), but I’d love to have it just as a collector’s item. Happy belated birthday, to you! Your boys are absolutely precious! I guess I would wish for one of the JAR perfumes. Toss up between Golcanda, Bolt of Lightning and Shadow. Would I ever receive them? As a gift from my husband… No Way! He’s careful with money and would never spend that much on a bottle of perfume for me. My daughter even tried to persuade him that it would be a lovely Mother’s Day gift while we were in Paris. I would love a sealed bottle of Guerlain’s Guet-Apens, as I am madly in love with the scent, the bottle and the complete unavailability of it. This is never going to happen… however my birthday is not until August and I am more realistically hoping for a full bottle of Mohur. A very big belated Happy Birthday Birgit – and how adorable is your welcome home committee!! It was so nice to meet you, Alex! I am getting a bottle of AG Songes Edp from my friends,can’t wait ! If money were no object I would absolutely love to get a bottle of Mona Di Orios Oud- I almost get tiny electric shocks every time I use my tiny 7ml bottle! Your boys are adorable! Happy Birthday, Katya! 🙂 Congratulations on the Songes. Oud is definitely a perfume for splits. A very happy birthday to you! I would love Kiki edp, closely followed by Kiki extrait. Or, the new Guerlain Muguet, which I feel I cannot want outright since I have never tried it, but the bottle and the green juice are beautiful. And I really, really want that necklace! That picture of your boys are adorable. They both appear to have such distinct personalities, but both so sweet! Hmm, those are great wishes, Kimberly. I was just trying to answer this question yesterday while thinking about the bottle to celebrate the promotion. I don’t know. Of course, I didn’t have the fantasy condition (“no matter the cost”). But even with this one… I haven’t tried any JAR’s perfumes. Or La Femme Nacré. Or, to that matter, any perfumes from Xerjoff – so I do not know if I like any of them enough to wish for a bottle. All I can think of now are actual bottles – Liquid Crystal or Xerjoff Murano Cobalto – Blue. Let me try again to insert the link for Liquid Crystal. On second thought, does it really matter how it smells? Nobody should be buying that bottle for the perfume itself. It’s a beautiful bottle to put on the dresser. People are paying much higher prices for decorative pieces. The fact that these ones also hold some liquid insisde is just an added… not even bonus – a quirk. That is very true. The really expensive things are not really widely known as no one tries them. HAPPY BELATED BIRTHDAY;;;; BIRGIT.You have the most gorgeous children I have ever seen. My birthday perfume wish would be a very, old ,vintage, 4 oz crystal bacarat bottle of Caron’s Bellodgia Perfume. While I am being greedy about my birthday wish, I would also like a bell jar of every one of Serge Luten’s perfumes. If one is going to be outside the box, then you must do it in a grandiose style. Wonderful wishes! Imagine a whole collection of bell jars, ah, what a sight for sore eyes. My birthday is coming up soon, and this has been my big debate with myself: what fragrance do I get? The boyfriend and I are moving at the end of the summer, so I really shouldn’t get any full-bottles. However, if I had to choose, I’d love to get Parfum d’Empire Fougere Bengale! My sample is sadly almost finished. Going for samplers is a good idea, a little goes a long way with us fumies. There is no-one in my life to give me perfume, but if there was, I’d like that person to research my tastes and then surprise me. Or to reseach my tastes and then select something for me from one of the lines that I cannot afford, Malle perhaps. Sigh. But then there is the Mother’s Day card my daughter gave me. More precous than any bottle of perfume. I agree, it is the love and effort that is so precious. 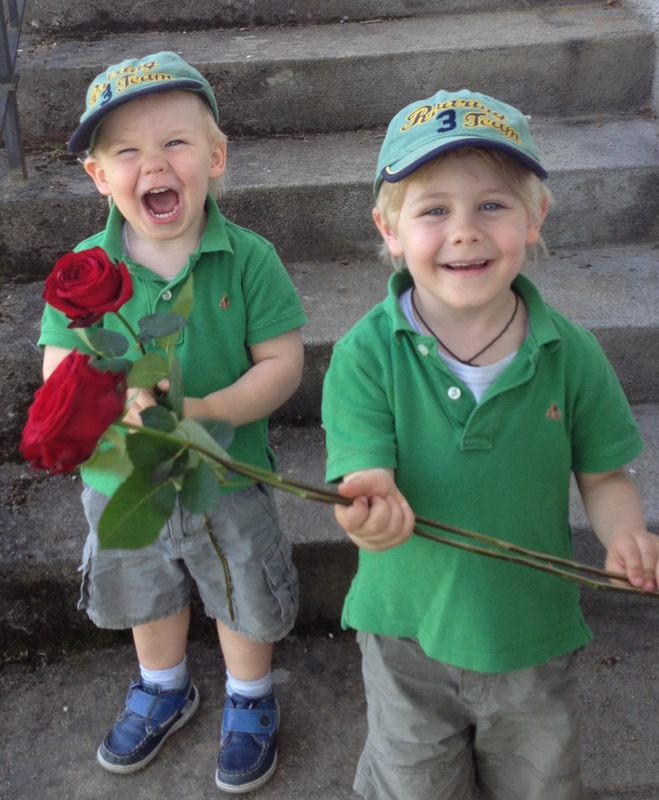 Oh my goodness, Birgit, what a sweet photo of your boys! On my last birthday, I received a FB of Timbuktu from my husband. Next year it would be a thrill to receive either Amouage Homage Attar or Vero Profumo’s Rubj extrait. Byzance Rochas, vintage Diorissimo….can’t decide ;-(. That’s a hard one…I think either Sycoromore or By Kilian Rose Oud. I have a decant of the former, and two samples of the latter, but I’d love to have enough to wear for weeks on end. Both a bit beyond realistic birthday present budgets tho! Hard decision indeed, both are gorgeous scents. Te Facebook Fragrance Friends group is a good place to be, when you want to participare in or host splits. You are welcome! Splits are a great thing! I’ve been a reader for ages, but never posted as I’m not in the same league as you guys – although I’d like to be! Can I turn the question round? It’s my birthday soon – what SHOULD I want? I don’t have a love, but lots of likes-a-lot (current favourites are eau de merveilles, l’eau d’hiver, and vetiver tonka, osmanthus yunnan), likes (kelly caleche, hiris, voyages d’hermes, chergui). But am searching for a love – i’d be grateful for any suggestions!!! Do you live near a niche perfume store? If you do just take a few hours and sniff your way through their stock, to get a general idea of what to explore more closely. If you don’t have that option, I would sample, sample, sample before commiting to a full bottle of anything. In my early days I have bought too much too quickly. Samples can be obtained through online shops, decanting sites or sometimes ordered directly from the brand websites. For your upcoming birthday – how about wishing for a gift certificate? You can use it for sample orders or only redeem it once you have found your first true love. That’s good advice – another trip to Les Senteurs and Harvey Nicks is due I think! I’ll keep reading – I’m compiling a list of ‘must smells’ base on your reviews! I really like your site by the way! If you go to Les Senteurs on Seymore Place, say Hi to Nick from me! I’m sure he can help you zeroing in on something that is perfect for you, he is very knowledgeable and sweet to boot! Pick anything? Amouage’s Homage Attar for my wife.